Nine hours, 15 minutes and nine seconds. That’s how long The Legal Genealogist can expect daylight today. 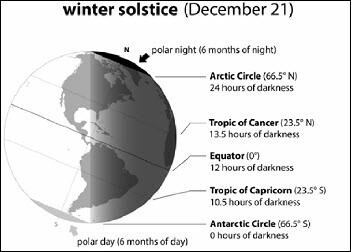 The shortest day of the year in the northern hemisphere. Now nine hours, 15 minutes and nine seconds is thoroughly depressing. And the fact that winter will only get worse from here on out makes it even more depressing. Until I realized three things. First, it could be a lot worse. A whole lot worse. And, third, starting tomorrow… the days get longer.